First of all, thanks to our pals over at Detroit Lions Forum for the tip in, but looks like our pals at the NFL Shop.com are at it again. Seems the grand old name blocker has blocked off OWEN and the #16 in a Detroit Lions Customizable Jersey. Well, as you heard from a couple of NFL spokesman in our previous story, I am sure these will not pass the visual test when the order is actually placed, but you can try. The CMSB is currently seeking comment from the NFL. What the eff? 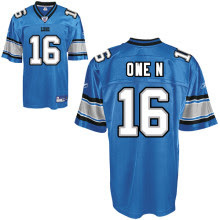 Owen is not derogatory and quite frankly sticking that on a Lions #16 jersey is hilarious.